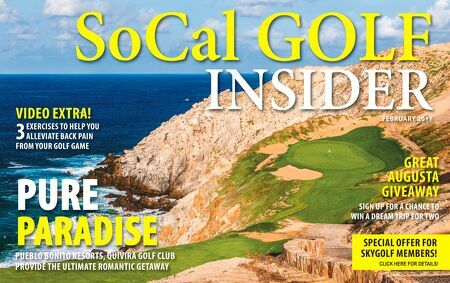 SoCal GOLF INSIDER FEBRUARY 2017 PURE PARADISE PUEBLO BONITO RESORTS, QUIVIRA GOLF CLUB PROVIdE THE ULTIMATE ROMANTIC GETAWAY VIdEO EXTRA! 3 EXERCISES TO HELP YOU ALLEVIATE BACK PAIN FROM YOUR GOLF GAME GREAT AUGUSTA GIVEAWAY SIGN UP FOR A CHANCE TO WIN A dREAM TRIP FOR TWO SPECIAL OFFER FOR SKYGOLF MEMBERS! CLICK HERE FOR DETAILS!